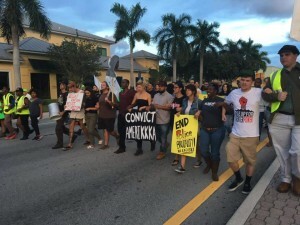 Hot off the heels of yesterday’s protest, The Alliance holds its monthly General Body Meeting tomorrow, Tuesday, September 27th, at 7 pm at the Unitarian Universalist Church of Fort Lauderdale. We’ll be offering updates and planning on our ongoing campaigns, as well as getting new people engaged in the Movement for Black Lives. There is a LOT going on with these campaigns! You can get started on finding out what we’re talking about here. 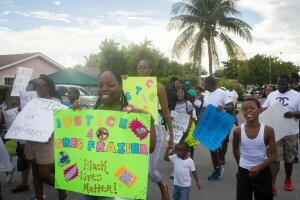 On Sunday, September 25th, Black Lives Matter Alliance Broward marched between BSO & FLPD headquarters on Broward Boulevard. We were joined by congregants from the River of Grass Unitarian Universalist Church and others. The Alliance will be continuing to plan more demonstrations to show solidarity with the Movement and victims of police brutality nationwide. You can read a recap of the march here. As Broward New Times also reminded us today, BSO has refused to release the names of the deputies that shot and killed Greg Frazier in his backyard in Pompano Beach on September 10th. The local Pompano Beach community is still fighting for answers and the Alliance will be continuing to support their struggle and posting updates about what is happening in Pompano when it becomes available. 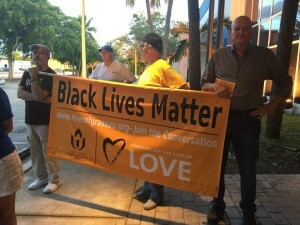 The Alliance’s Police Brutality Sub Group has been meeting on a weekly basis to continue to demand changes in BSO, FLPD, and the State Attorney’s Office. We’re also gathering support for our friend and fellow activist, Billie, who was brutally assaulted by BSO jail guards earlier this year and is headed to trial in November. The Police Brutality group will be continuing to keep people informed on ongoing efforts to get justice for Jermaine McBean, Michael Eugene Wilson, and many others. The Development Initiative is the Alliance’s introduction and training group. It has ongoing meetings to do follow-ups with people interested in the Alliance and getting them engaged with ongoing campaigns. ALSO written in Broward New Times today, the Alliance continues its efforts to convince the City of Hollywood to take down street signs named after Confederate Generals Forrest, Hood, and Lee. This breakfast sharing occurs every first Wednesday of the month at 9 am in Lincoln Park on Sistrunk Blvd. Last month, things got a little weird between the food sharing volunteers and the City of Fort Lauderdale. But it’s a great volunteer activity for the Alliance! Fort Lauderdale Food Not Bombs also shares dinner with the homeless of downtown every Friday at 4:30 pm at Stranahan Park. 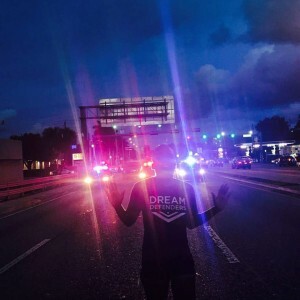 Broward Dream Defenders’ end-of-month events at the Megaphone are Thursday and Friday. DDCypher is Thursday, 9.29 at 7 pm at 807 NW 13th Terr, Fort Lauderdale, and Movie Night is Friday, 9.30 at the same time and location. Black Lives Matter movement co-founder Alicia Garza will be the keynote speaker at the South Florida Women & Femme Economic Congress, which is Saturday 10.1 from 9:30 – 3 pm at Florida Memorial University in Miami Gardens. 2nd Annual Ladyfest is also Sunday, October 2nd from 11 – 4pm at MADE At the Citadel in Miami. Jasmen from the Alliance and possibly others are hosting workshops at this great event. Looking ahead slightly, POWIR (People Opposed to Imperialism, War, & Racism) is holding an anti-war action at the Federal Courthouse on Broward Blvd on Saturday, October 8th at 3:30 pm with support from the Alliance. Whew, you got all that? Don’t worry, there’s sure to be more. Keep up with our website calendar… Now let’s get free.